face sagged and showed no emotion. steaming concrete into aching light. I am proud yet humbled to present to you these works created by humans who have faced death. Welcome to our fourth issue, which features poems, stories, memoirs, art, and photography depicting war and life viewed through the eyes of veterans and civilians alike. Through this issue, we hope to fight for awareness and treatment of mental illness, especially for our veterans, all the while striving for non-violence and mutual co-operation and compassion in order to solve humanity’s problems. We have Vietnam veteran Preston Hood to thank for this issue, as he suggested the idea to me when we first met at a Moonstone Arts poetry reading in December of 2014. How remarkable is it, that in the year 2015 we can still hear the voices of those who’ve experienced World War 2? 90 year old Hal O’Leary, a West Virginia native and veteran of the Allied campaign against the Nazis in Western Europe, wrote an enduring and reflective memoir piece that we have the honor of sharing with you in this issue. Other highlights from veterans in this issue: Cold War era Army vet Alex Marshall imagines the view of an ancient Chinese soldier from his Meditation Tao series of poems, Iraq War vet Alecc Costanzi emits a pungent warning in his poetry, Jon Turner, another veteran of the war in Iraq, shows us a glimpse of the “enemy’s” perspective, Doug D’Elia, who was a medic in Vietnam, shares with us the difficulty of reassuring a dying soldier, Lisa Van Wormer, an Iraq War veteran, accomplishes the near-impossible task of expressing the sorrow and bonding that occurs after a fellow soldier’s death, in second person mind you, Jay Dardes, a Vietnam era vet, describes an encounter between a vet with ptsd and a therapist, and James Smith, a veteran of the 25th Infantry Division in Vietnam, gives us an outstanding and at times humorous look at the hypocrisy of those who say they support our troops, yet are not sincere. In our most important issue yet, Whirlwind Magazine seeks an understanding between civilians and veterans. We not only want to show our appreciation to veterans who’ve contributed to our past issues, such as Peter Mahoney and Lamont Steptoe, but we’d like to remember all people who have been killed because of war. This issue is dedicated to Preston Hood’s late son, Arrick Hood. 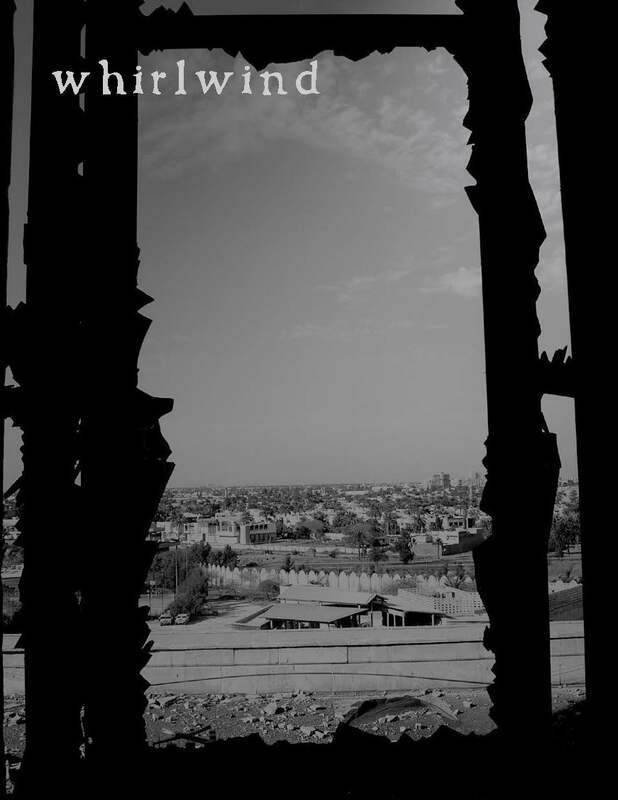 An early draft of Issue 4’s cover: “Window to Baghdad” by veteran Hayden Van Wormer. issue is dedicated to Preston Hood’s late son, Arrick Hood.